Northwestern University scientists and collaborators have discovered that if the graphene used in experimental fuel cells (used as electric power sources) naturally has a few tiny holes in it, is provides a proton-selective membrane that could lead to improved fuel cells. A major challenge in fuel cell technology is efficiently separating protons from hydrogen. 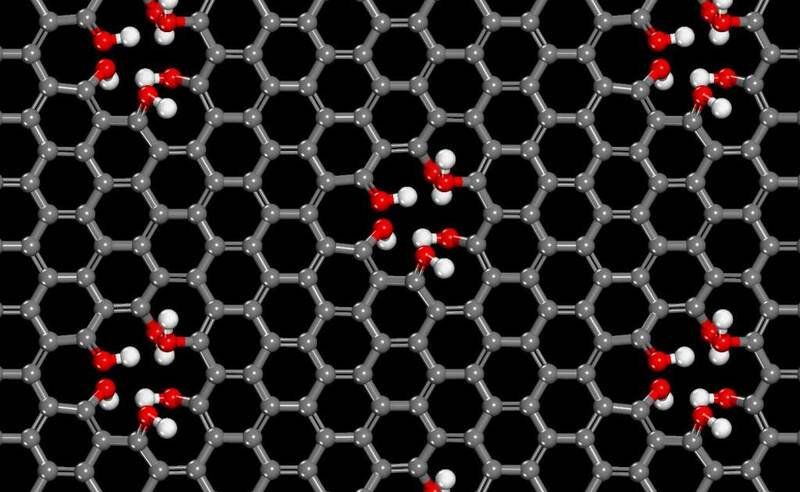 In a study of single-layer graphene and water, the Northwestern researchers found that slightly imperfect graphene quickly shuttles protons — and only protons — from one side of the graphene membrane to the other. The membrane’s speed and selectivity are much better than that of conventional membranes, offering engineers a new and simpler mechanism for fuel cell design. The thinness of the atom-thick graphene makes it a quick trip for the protons, said Geiger, a professor of chemistry in the Weinberg College of Arts and Sciences. With conventional membranes, which are hundreds of nanometers thick, proton selection takes minutes — much too long to be practical. The open-access study was published Tuesday March 17 by the journal Nature Communications. Geiger’s research team included collaborators from Northwestern, Oak Ridge National Laboratory, the University of Virginia, the University of Minnesota, Pennsylvania State University and the University of Puerto Rico. The work was supported by the Fluid Interface Reactions, Structures and Transport (FIRST) Center, an Energy Frontier Research Center funded by the U.S. Department of Energy. Proton transfer across single-layer graphene is associated with large computed energy barriers and is therefore thought to be unfavourable at room temperature unless nanoscale holes or dopants are introduced, or a potential bias is applied. Here we subject single-layer graphene supported on fused silica to cycles of high and low pH, and show that protons transfer reversibly from the aqueous phase through the graphene to the other side where they undergo acid–base chemistry with the silica hydroxyl groups. After ruling out diffusion through macroscopic pinholes, the protons are found to transfer through rare, naturally occurring atomic defects. Computer simulations reveal low energy barriers of 0.61–0.75 eV for aqueous proton transfer across hydroxyl-terminated atomic defects that participate in a Grotthuss-type relay, while pyrylium-like ether terminations shut down proton exchange. Unfavourable energy barriers to helium and hydrogen transfer indicate the process is selective for aqueous protons.